All around the world, small towns hold festivals and celebrations that are virtually unknown to outsiders. I love these kinds of events and I find they are a great way to get a better understanding of a place. While on vacation this summer in the hills of Tuscany our schedule just happend to coincide with such an event. 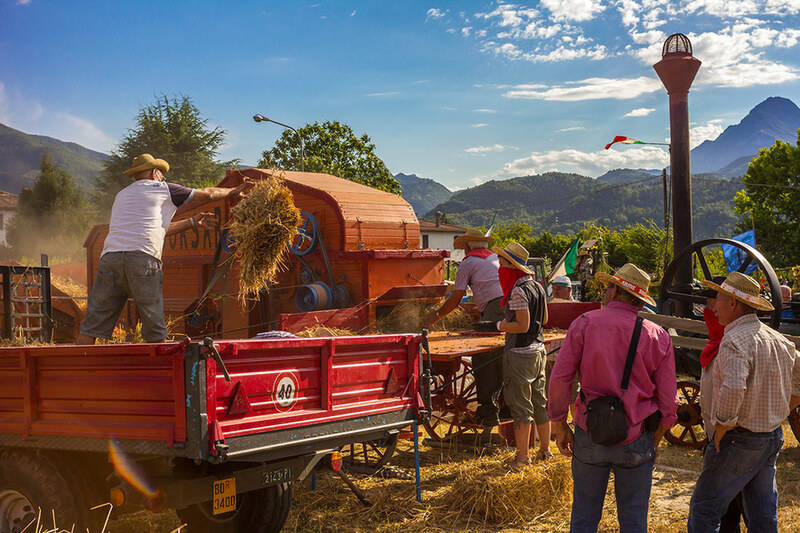 La Trebbiatura del Grano, which means "The Threshing of the Grain", is a festival that takes place in many small towns in Italy. It is a celebration of the time when all of the farmers gather together and communally process their grain. In the town where we were staying, San Pietro in Campo, the festival begins with a parade of tractors which is seen in the video above. Every farmer decorates their tractor and joins the parade to the field behind the church. The last tractors in the parade are transporting the grain threshing machine. After everyone arrives, it is time for a feast. Everyone eats together at long communal tables near the church. The food is very cheap and very hearty. A local farmer tosses raw grains to the first stage of the threshing machine. Once the meal is finished, the real work of threshing the grain gets started. 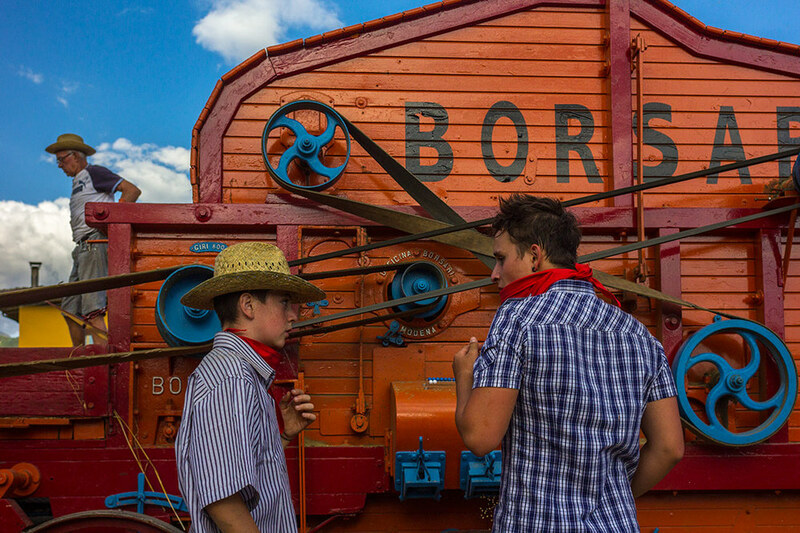 Locals wearing traditional hats and clothing work the large orange threshing machine. That machine takes raw wheat and separates the grain from the stalks. Two young men discussing at the side of the machine where the processed grain falls out. The grains fall out of the side of the machine while the hay is gathered and baled automatically at the back of the machine. It is an amazing piece of engineering. A man inspects the final stage of the threshing where grain stalks are bailed into hay. La Festa della Trebbiatura del Grano just happend to occur right across the street from our guest house, Casale I Girasoli. If you ever plan a trip to Tuscany, specifically the Barga region, I highly recommend staying there. The room was spacious, our hosts were friendly, the rates were more than fair and they had a beautiful garden in which we were given many vegetables. If you are there in late July, you will also get to witness La Trebbiatura. Posted in Travel, Video and tagged with Festival, Barga, San Pietro in Campo, Italy. September 27, 2012 by Steve Ellington.